These muffins come out very moist and are very delicious. I originally adapted them from a recipe I found online, which I’d share with you if I had saved it. It was one of those rare occurrences where my original adaptation was spot on, so I didn’t need to refer to the original recipe. The first time I made these, my husband and I ate almost half a pan of mini-muffins for breakfast. Ahhhh weekend indulgences. 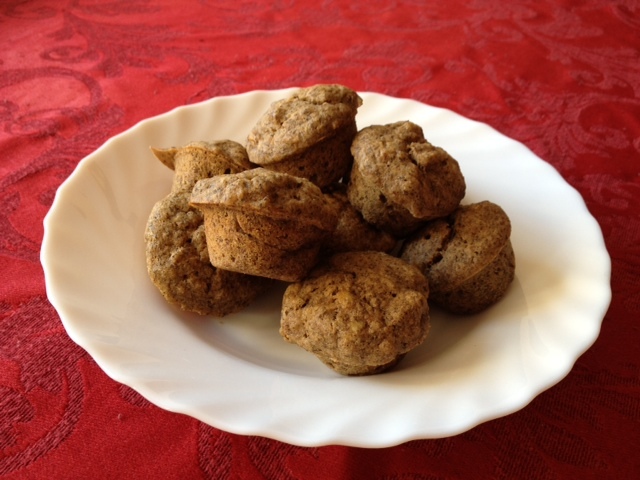 I prefer to make these with whole grain flour for extra fiber. I think I’d also like to try cutting the fat a little bit, so I am going to try adding unsweetened apple sauce in place of half of the butter/oil. Lightly grease your pan. I use melted coconut oil. In a separate bowl, cream together butter, vanilla and sugar. Stir in eggs, maple syrup and mashed bananas until well blended. Add the banana mixture to the flour mixture; mix until batter is just moist. Bake in preheated oven for 20 to 30 minutes, until a toothpick inserted into center of the muffin comes out clean. Note: You could add 1/2 cup chocolate chips, or nuts without adjusting the basic recipe. If you add berries or other fruit toss them in an extra bit of flour so they aren’t too moist. Flavour: Make this recipe your own by adding your favourite spices, like cardamon, allspice, nutmeg, or cinnamon. All of these do wonders with gluten free flours. *Whole Grain gluten-free flour: I make my own all purpose whole grain flour mix using the following ratio: 1c Buckwheat, 1c Brown Rice and 1/2c starch (tapioca, arrowroot, potato, or corn). I make this ahead of time and keep it on hand. **Amount of sugar depends on taste. I prefer less sweetness and find these perfect with 1/4 cup of sugar. These look scrumptious! I’ve been on a quinoa kick & made banana muffins using quinoa flour and flakes(http://eatingwhole.net/2012/10/28/perfect-banana-nut-butter-quinoa-muffins/). Thank you for sharing!